GQR is the gold standard of polling in Venezuela, and their last results are encouraging. However, it is a bit disquieting to think these are the people who got Al Gore most of the votes in the last election, but couldn’t get him into office! According to a new national survey, the widespread public perception that Venezuelan President Hugo Chavez is blocking a recall vote on his presidency has helped produce a dramatic decline in his level of support. 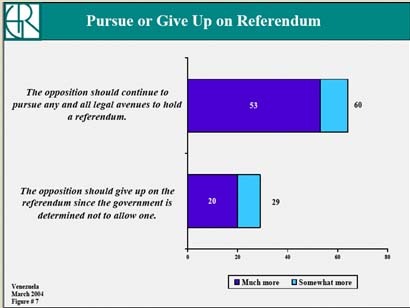 A strong majority (59 percent) of Venezuelan voters believes that Chavez is trying to prevent the recall referendum from taking place, even though nearly two-thirds (64 percent) favor holding a referendum. Two-thirds (67 percent) of the electorate also believes the president will do anything to hold on to power, and the same share disapproves of Chavez’s performance on human rights. The sense that Chavez is trying to defy the popular will on the referendum has helped lift support for revoking his mandate by 10 points since November to 62 percent, according to the survey by Greenberg Quinlan Rosner Research, a polling firm based in Washington, D.C. The survey, which involved face-to-face interviews with 1,000 adults, was conducted from March 12 to 22 for RCTV, a Venezuelan television and radio network. The survey indicates that Chavez’s standing among his lower-class base has eroded, as a strong majority (58 percent) of the poorest half of the country’s voters now favor revoking his mandate. The Venezuelan Constitution allows for a recall vote after the mid-point of elected officials’ terms. Venezuela’s electoral council has ruled that only 1.8 million of the 3.4 million signatures collected by the opposition in support of the referendum are valid. 2.4 valid million signatures are required. 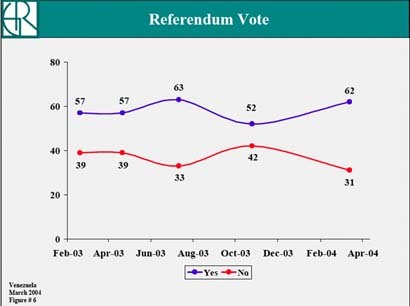 The electoral council’s stance has done serious damage to its credibility, the survey shows. Only 40 percent of voters approve of the council’s performance, a 23-point decline since November, and 64 percent believe that the council’s decision on the signatures was driven by political, rather than technical, grounds. The Venezuelan public is genuinely fearful that if the referendum does not take place, the country will face intensified unrest. 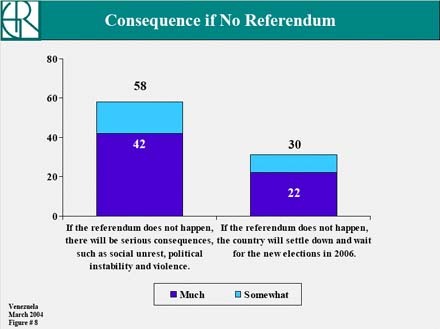 About two-thirds (64 percent) of voters believe that if the referendum is not held, there will be greater political instability and violence. In focus groups held this month by Greenberg Quinlan Rosner Research, numerous participants expressed concern about a potential civil war. Although most Venezuelan voters remain hopeful that the referendum will be held, they are also looking to the international community to actively support the referendum process. 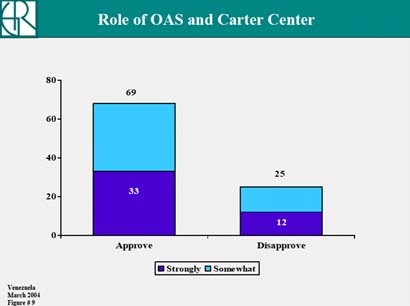 About three-quarters of the electorate supports the role that the OAS and Carter Center have played as observers and mediators thus far, and a comparable share of opposition supporters say they would support OAS diplomatic or economic sanctions in the event the referendum does not take place.